Since you've made it through all of the episodes of "The Monticello Party Line" in my collection, I'd like to present you with a special premium offer, absolutely free. In PDF form, you can download the 1937 edition of the series's giveaway recipe book. 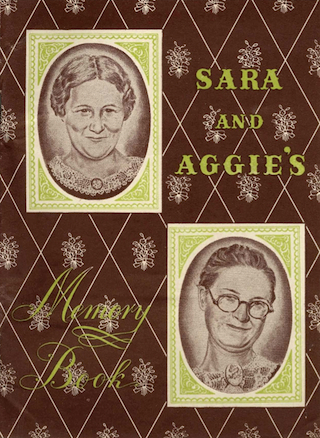 This one's titled "Sara and Aggie's Memory Book" and includes background information on the show, publicity photos of the cast in character, and a collection of household hints and recipes. You can see the 1936 edition of the giveaway cookbook in a previous post on the blog. And now, the last program in our ongoing series, "The Monticello Party Line"; at least, this is the last one I have in my collection at the moment. Program 776 was originally heard February 13, 1939. Curly calls on Cristy Warren to see if he can make amends for the horseshoe game bet. Can he convince her to go with her heart and be friends with David? The characters mention that tomorrow is Tuesday, Valentine's Day. The show was transferred from an original vinyl Flexite transcription pressed by Columbia, matrix number 075-2. It is previously uncirculated among otr collectors. 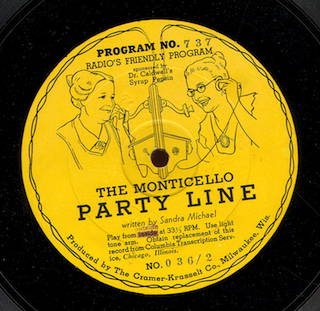 We're almost done with our run of "The Monticello Party Line", a syndicated program sponsored by Dr. Caldwell's Syrup Pepsin. Program 775 of the series was originally broadcast February 10, 1939. Cristy runs into Carlton Ross at the drug store. Will she bring up the subject of the horseshoe game bet? The show was digitized direct from an original vinyl Flexite transcription pressed by Columbia, matrix number 078-2. It is previously uncirculated. 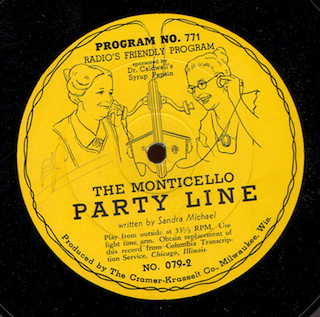 Program 774 of "The Monticello Party Line" was originally broadcast February 9, 1939. In this episode, Jack's friend Rocky does a pitch for the sponsor, Dr. Caldwell's Syrup Pepsin. In the story, Carlton and Marilyn discuss the horseshoe game bet and Cristy catches up on all the gossip in town. The show was transferred from an original vinyl Flexite transcription pressed by Columbia, matrix number 080-2. It is previously uncirculated. Now this week's two episodes of "The Monticello Party Line", a 1930s serial with few surviving episodes. Program 773 of the series was originally broadcast February 8, 1939. Cristy is upset about the horseshoe game bet - will she cancel her date? The show, as usual, is sponsored by Dr. Caldwell's Syrup Pepsin. Our program was transferred from an original vinyl Flexite transcription pressed by Columbia, matrix number 083-2. It is previously uncirculated. 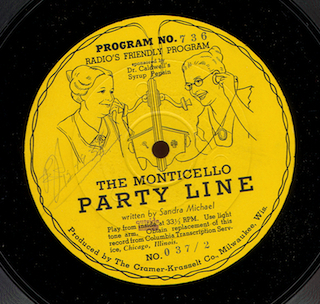 Program 772 of "The Monticello Party Line" was broadcast February 7, 1939. Curly and Cristy have a talk and it looks like Curly's going to be a grandfather. But, Curly lets it slip that Cristy's date is the result of a bet on a horseshoe game. The show was digitized from an original vinyl Flexite transcription pressed by Columbia, matrix number 076-2 and is previously uncirculated. 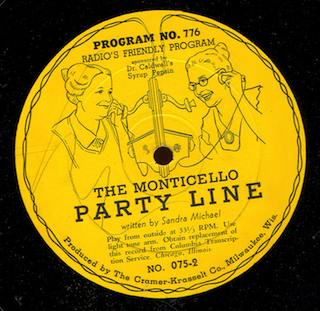 We continue with our weekly look at "The Monticello Party Line", a syndicated 30s serial sponsored by Dr. Caldwell's Syrup Pepsin and written by Sandra Michael. Program 771 was originally heard February 6, 1939. Clem is looking forward to spring as Aggie nags him to shovel snow off the sidewalks. David is taking out Cristy, another school teacher in Monticello, out on a date. Is romance in the air? Meanwhile, in Alaska, Jack Owens talks with Rocky about returning to the states. The show was transferred from an original vinyl Flexite transcription pressed by Columbia, matrix number 079-2. It is previously uncirculated. 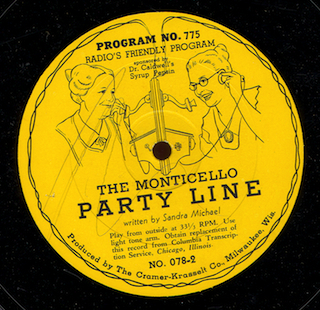 In program 738 of "Monticello Party Line", originally heard December 21, 1938, the nurse taking care of Jack talks over their trip to the boss's place in Nome with Jack's friend Rocky. Meanwhile in Monticello, Sara and Aggie are getting amateur radio sets for Clem and Curly for Christmas. It's also the last day for the Sara and Aggie apron offer. The series was written by Sandra Michael and sponsored by Dr. Cadlwell's Syrup Pepsin. The show was transferred to digital direct from an original vinyl Flexite transcription pressed by Columbia, matrix number 038/2. It is previously uncirculated. We have just six more episodes of "Monticello Party Line" to run through over the next three weeks. 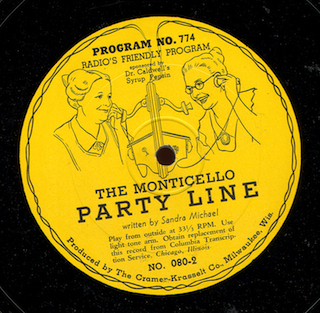 We pick up where we left off last week with our continuing rare syndicated serial, "The Monticello Party Line", written by Sandra Micheal and sponsored by Dr. Caldwell's Syrup Pepsin. Program 737 of the series was originally heard December 20, 1938. In Alaska, Jack, who is recovering from an accident, gets a letter from Aunt Willa, the kindly Monticello matron that gave him the money for a new start in his life. What will Willa say in the letter about Marilyn's plans to get a divorce. Jack's been invited to spend Christmas with the boss's family in Nome - is there a possible new romance in Jack's life? Meanwhile, back in Monticello, Clem and Curly speculate on what Sara and Aggie might buy them for Christmas. The show was transferred from an original vinyl Flexite transcription pressed by Columbia, matrix number 036/2. This episode of the series is previously uncirculated. And now another previously lost episode of "The Monticello Party Line", sponsored by Dr. Caldwell's Syrup Pepsin. Program 736 was originally broadcast December 19, 1938. Aggie and Sara talk about Christmas presents. Meanwhile, in Alaska, Jack Owens mulls over the news from Marilyn that she wants a divorce. The program was digitized directly from an original vinyl Flexite transcription pressed by Columbia, matrix number 037/2.